Carl Trueman's little article on Luther's Theology of the Cross is one of the best short theology pieces I've read. I share it with friends. It's required reading for our interns. I've read it multiple times. 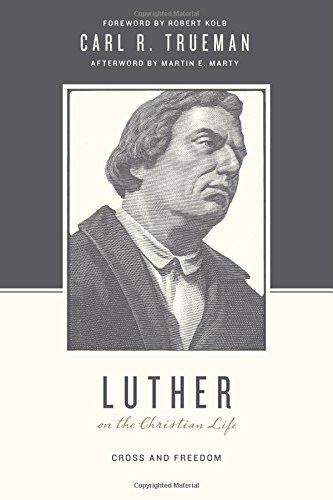 So when Trueman published a full, popular book on Luther (his area of expertise), I promptly started reading it. Perhaps I'll actually review it when I finish. This points to a further implications of Luther's sacramentalism: the nature of the ministry. We saw in the last chapter that the ministry is a ministry of the Word, that God acts through the Word read and proclaimed in the church. To this we must now add that the ministry is also one of sacraments. As the minister preaches each week, so he also administers baptism and the Lord's Supper. It is important to understand that in all this, luther regards God as the agent. The popular phrase of "doing church" is thus entirely inappropriate within a Lutheran framework: Christians do not "do church in any "ultimate or definitive way. God "does" church. The minister--preaching, baptizing, and officiating at communion--is merely an instrument by which God achieves what he intends. This is surely an antidote to the evangelical church's perennial obsession with the big, the spectacular, the extraordinary, and the impressive. The quest for the next big thing that allows the church to ride the cultural wave, or the technical silver bullet that makes outreach and discipleship so much more effective, would be entirely alien to Luther's way of thinking. Preach the Word and administer the sacraments: that is the minister's calling; these are the tools of his trade and the mans by which is is to address pastoral problems. That they seem weak and ineffective from a technical perspective is irrelevant: their power and effectiveness come from the agent, God himself.